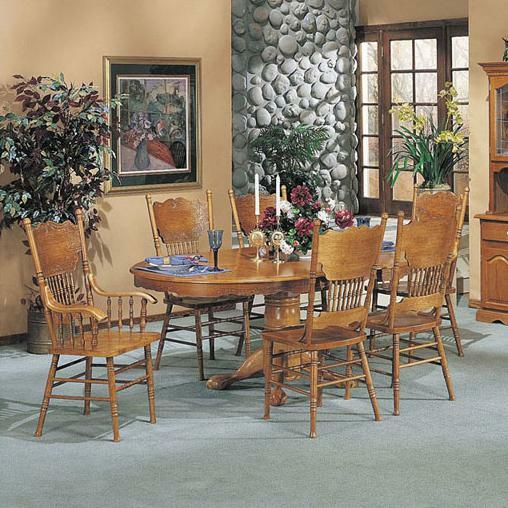 Add a feeling of rustic simplicity to your home with this 7-piece dining set from the Nostalgia collection. 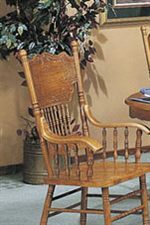 Old-fashioned style meets a rich oak finish for a warm and inviting atmosphere. 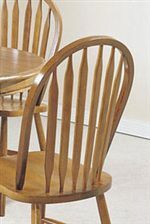 Double press chair backs, turned spindles, and carved detailing reflect the careful craftsmanship of the pieces. A single turned pedestal base is sturdy and supports the scalloped-edged table that can extend to 72" to accommodate guests during dinner parties. The Nostalgia 7-Piece Dining Pedestal Table and Press Back Chair Set by Acme Furniture at Furniture Superstore - NM in the Albuquerque, Los Ranchos De Albuquerque, Rio Rancho, Santa Fe, Corrales, NM area. Product availability may vary. Contact us for the most current availability on this product. Table Info One 24" Leaf Extends Table Length to 72"
A blend of traditional design details and a warm oak wood finish gives the beautifully crafted pieces of the Nostalgia dining collection a rustic charm and simple sophistication. 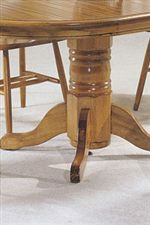 Arrowback Windsor chairs, turned pedestal table bases, and scalloped table edges highlight the great care put into adding homey and inviting details to each design. The oval tables include leaves that can extend the table length to accommodate extra guests during meals and dinner parties. The Nostalgia collection is a great option if you are looking for Traditional furniture in the Albuquerque, Los Ranchos De Albuquerque, Rio Rancho, Santa Fe, Corrales, NM area. Browse other items in the Nostalgia collection from Furniture Superstore - NM in the Albuquerque, Los Ranchos De Albuquerque, Rio Rancho, Santa Fe, Corrales, NM area.